Due to be implemented in the summer of 2005, the Foundation Years programme has been devised to be the bridge between medical school and specialist training for all junior doctors embarking on a career in medicine. With an emphasis on clinical skills and rotating through a greater number of different disciplines, this new programme ensures doctors get a better grounding in preparation for specialising. 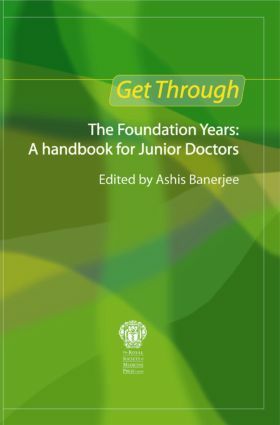 Forming part of our best selling Get Through series of titles, Get Through the Foundation Years: A handbook for junior doctors will surely be just the title every new doctor needs to get them through these crucial years. If you want to know all about the framework of the foundation years and the issues surrounding them, then don't look any further. Editor Ashis Banerjee has compiled a one stop source of information providing everything you need to know. Although it is aimed at junior doctors, it's good reading material for medical students and senior doctors who wish to get a grasp on the foundation programme without getting too bogged down in detail. This is a useful addition to the bookshelf of any doctor. For those keen to gain a job on a FY scheme, it has all the key phrases and useful interview information that would make it a worthwhile investment. This book picks out all the important papers relaying to Modernising Medical Careers…it gives a brilliant overview of the benefits and drawbacks of change…extremely informative with many contacts included,…Get Through the Foundation Years: A Handbook for Junior Doctors is an invaluable read.